Mamma would love you to meet Emma - the founder of Grace & Able. Her business is centred around supporting so really talented makers all over the world, not just providing the artisans to sell their wares but also teach important business skills and assist their communities in the process. Mamma particularly loves the stories that you get to read about the maker and the difference your purchase can make to someone on the other side of the globe! Grace & Able is a social enterprise that aims to create change and build community through opportunity provided by business. Through the purchases of our handmade jewellery collection, we are helping people rise above poverty and carve out futures filled with purpose and hope. I’ve always had a sensitive heart to injustice but I was tired hearing people saying the problems are too big and we are too far away. Business as an agent for change can be so powerful! 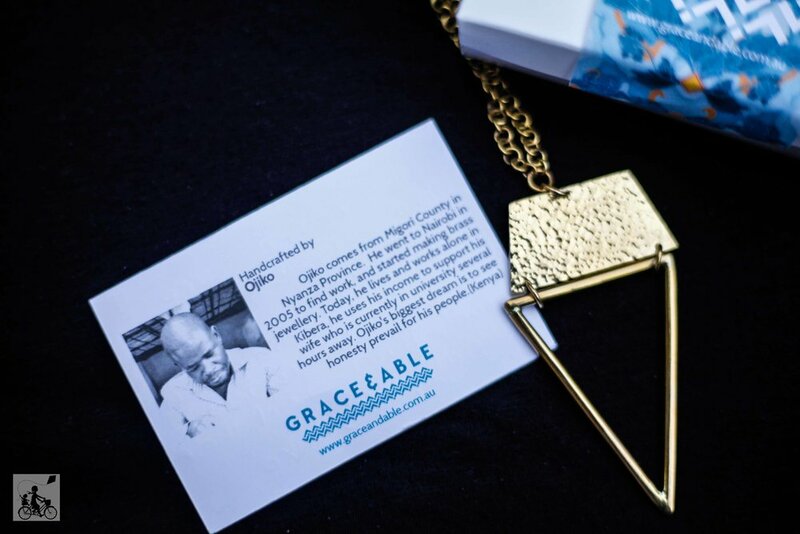 Through trade, Grace & Able is offering power back to the consumer, and enabling your money, your purchase to truly matter. I think Mother Teresa said it best: ‘We think sometimes that poverty is only being hungry, naked and homeless. The poverty of being unwanted, unloved and uncared for is the greatest poverty. We must start in our own homes to remedy this kind of poverty.” Grace & Able is the cross point for that. Australian Mums can make a difference in their own homes by supporting the work we do with the poor and vulnerable. I call it a win win! Is this a business you have started after having kids? How does it relate to your pre baby career? I started Grace & Able two years ago, with a 5 year old and 1 year old. Crazy timing, right? The lovely thing is how it’s a complete melting pot of my pre-baby life – I grew up in the Philippines for 8 years so have always witnessed work to empower the vulnerable first-hand, but it’s also drawing on my design background in Visual Merchandising and Interior Design. The Mammas love a good name - Where did the name Grace & Able come from? Actually, the name comes from my belief to live out life with grace in everything I do and enable others to live out better lives. I wouldn’t be where I am without grace extended to me. It’s a pay-it-forward philosophy. By grace I am able to be here, to do more and provide opportunity to others to be able to do more. So really its my life philosophy that inspired the name. That and it’s inspired from one of my favourite books. Yes always! I’m working hard on the next collection, preparing to travel to Uganda again to develop and implement further training there, collaborating with some new groups in Asia, running markets and storytelling at parties. It’s all quite fun and exciting! But because it is all about sustainable futures, it takes time to develop a lot of these tasks, so it is not always quick! Sometimes being patient is hard when you are excited! But the most exciting thing happening is seeing the differences in our artisans lives beginning. I’m beginning to see results such as children staying in education, women being empowered in families and communities where that doesn’t normally occur and families staying together when desperation and poverty would have driven them apart. I’m seeing the self-worth of individuals increase because of reputable employment. This is really my driving passion! Oh, almost everything. And yet truthfully, also nothing different. I’m learning so much all the time, I wouldn’t swap the struggle. But if pushed, I suppose I would have like to be better organised when I began. The juggle is real – who is in your family and how do you juggle biz/working/home? Yes, it certainly is real! But what a privilege too! So in my family: I am married and have two boys, 7 and 3, and Chutney the dog. Lately I’ve been balancing work by doing it after the kids are in bed and in the mornings while hubby does the school run. My kids are pretty encouraging and love to be involved so I have been know to bring my 7 year old along to the odd party or market. I try to not growl at interruptions and welcome them but this doesn’t always happen! And I still haven’t balanced out the housework, so I guess it’s a balance in progress. What super power do you wish you had as a Mum? I haven’t seemed to have harnessed any extra special skills so I guess I would want the super power of Speed Cleaning Housework! Can I say all of the above! A good sense of humour is vital because for every step forward, there are a hundred back, right and everywhere else, which can be disheartening and frustrating so you’ve got to have a laugh to survive. So that, coffee and whole lot of prayer really. I’m an Eastie girl of old. But I do love all of Melbourne really, its a beautiful city! We love going for walks on the beach or in national parks, but we do also have a soft spot for The Moonlit Sanctuary in Pearcedale. We find it hard to go past Noodle Box but I love D.O.C, in Mornington. We’ve done a few so its hard to choose… but we certainly loved the Daylesford area and off-roading around there (my hubby is a land rover fanatic) so maybe that one… for now. As family we sing-a-long to some many random songs but personally, I love a bit of Pink or Gwen Steffani. Yes, there are a few actually! I’ve got some Eastside Markets coming up and family trip to my old stomping grounds: Glenferrie Road, Hawthorn. Plus the growing list of playgrounds to check out thanks to your wonderful reviews! wanna know more? click here to enquire about hosting a Grace and Able show, see the range and check dates for Emma's next market.